Prepare for the unpredictable. Prepare for war. Prepare for the light to have difficulty penetrating a world enshrouded in darkness. Prepare for a novel in the dark fantasy genre that guarantees to be a promising debut for a brand new author. 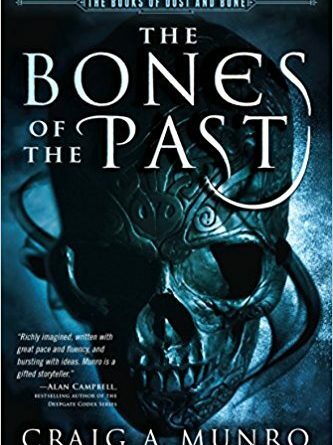 After emerging as one of three winners from Inkshares’ The Sword & Laser Collection Contest: The Sequel in 2016, the time has come for Craig A. Munro’s The Bones of the Past to be published. No synopsis can truly bring justice to this novel for so much happens within the five hundred plus pages. One needs to read it to get the full experience and, whoa, are readers in for one helluva ride. Great cities have been facing dark and distressing times. Sacral, a city that vanished long ago, has reappeared. Its people, who have enjoyed countless years of peace, find themselves thrust into a war where normal people, like Maura, must rise up to fight and defend their home. The old kingdom of Bialta suffers from an influx of demons roaming the streets at night. Some demons hide in plain sight by taking over a living person, as one does to a little girl named Nial. The Night Guard was formed to fight these demons and Salt, former sailor turned Night Guard, will have to learn what it takes to survive in the dark. In Tolrahk Esal, Carver, a master in the magic of fleshcarving, is creating disturbingly powerful creatures to wreak havoc across the land. Not even the strong may survive the inevitable turmoil, so who will be strong enough to fight against it? 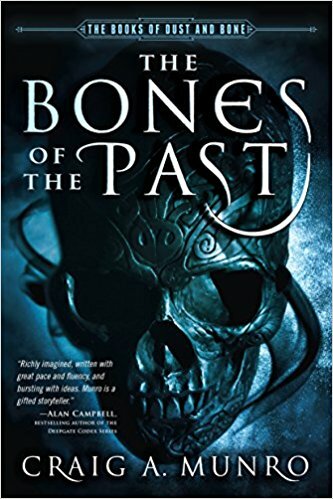 For a debut, The Bones of the Past is an impressive work and an excellent addition to the dark fantasy genre. To be able to juggle so many characters plus begin to introduce an entirely new fantasy world and have it all make sense to readers is a feat difficult to do on the first try yet one Munro succeeded at. Granted, it can be tricky to follow in the first couple of chapters for the readers are being introduced to so much in such a short span of time, but once all of the characters have been introduced, the rest of the story is fairly easy to follow. This is thanks to Munro’s fluid writing style as he includes a healthy balance of description and dialog. Readers will be following at least seven or more different stories as they jump from character to character. Due to this, readers will more than likely find that they cannot stop reading, wanting to know what certain characters will do next as they have their time in the spotlight. And as with all stories that have many characters to follow, readers will have their favorites that they will want to know even more about. What makes Munro’s characters so intriguing is the fact that there are those who just want to help and those who have evil intentions, each with his or her own unique personality. And if any reader becomes confused on who is who in the story, Munro has included a helpful list of characters at the beginning of his book and has categorized them by where they live. Once readers have a better grasp on the many characters they will be following, they can then focus on the places and races Munro introduces. Luckily, there are not as many locations introduced as there are characters, the main areas readers experience being the cities of Sacral, Bialta, Dreth, and Tolrahk Esal. In each of these places, readers will experience demons, magic, religion, war, stories of times long past, and stories of the deity the people worship: the White Mother who defeated the Deceiver. Readers will find themselves intrigued with these new fantasy cities, but not wishing to live in any of them due to the darkness lurking somewhere within each one. There is so much to say about The Bones of the Past and the final sentences of its synopsis sum it up the best: “In this epic tale, there is no good and evil. Armies march, demons feed, and deities unleash their powers on a world that will never be the same.” It is a book that readers should experience for themselves for it is a ride through darkness, unpredictability, suspense, and intrigue. Munro has impressed with his debut novel by creating a fantasy world that can only get bigger, developing characters that will endure so much more, and a story that can only get darker with future books in his new The Books of Dust and Bone series.